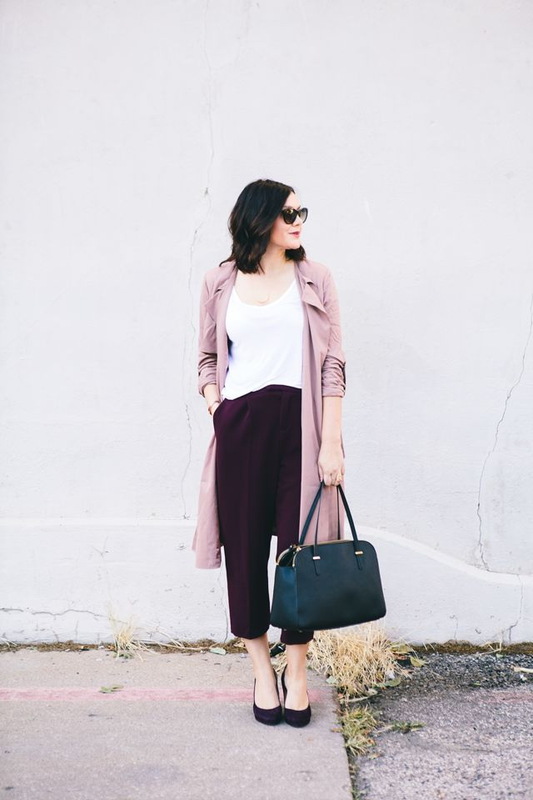 The cold season is in, but that doesn’t mean we have to put away sweet and ladylike colors and wear neutral color outerwear. In today’s blog post I gathered pastel coats and jackets street style inspiration. Trust me, you gonna stay cozy and stylish, all you need is to choose your favorite color. Like it or not, but pastels are set to be huge this year. The following street style collection features fabulous coats in different hues, starting from blush, violet, light blue, to powder cream, pastel white-green, cream-peach and sherbet colors. Each one of these outerwear pieces is ideal for unpredictable Fall and Winter weather. As you can see from the images below, every outerwear piece looks both comfy and trendy. What are you waiting for? It’s time to incorporate fresh colors into your wardrobe. Pastel peach tailored coat is worn atop striped semi-sheer shirt tucked in black leather shorts completed with cream-white heeled pumps.